I don’t normally promote such things in advance, but I’m going to be at this one and it looks like fun. Among other things we’ll have the first public run out of the Tribes of Legend game. Speaking of which, there’s an animated gif of photos from the new range. I’ve picked a nice one out for you in glorious not-changing-every-tenth-of-a-second-o-vision ™. “Christmas open days Friday 2nd and Saturday 3rd December! At 2pm on Saturday the 3rd of December, foundry will be hosting the first ever participation game of our exciting new Greek mythology release ‘Tribes of Legend’, written by renowned games designer Jake Thornton! 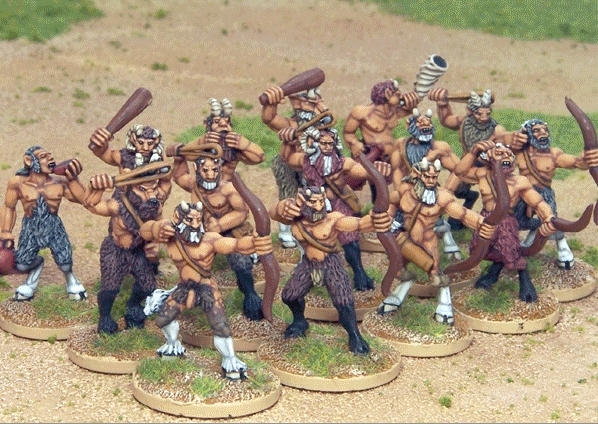 This fast paced and entertaining battle will see a rampaging tribe of drunken centaurs attempting to overrun the camp of a staunch warband of amazon warriors, so if you want to take part, not to mention meeting the author himself, phone or email us now to reserve your place before we book up! If Nottingham’s not too far for you to travel, why not pop along? I’ll be taking pictures and writing up a report afterwards, but it won’t be the same without you! This entry was posted in Events, Tribes of Legend. Bookmark the permalink.